Wherever you go in the world, you encounter seemingly "simple" people with their heads up high, and a glow of deep satisfaction on their faces. 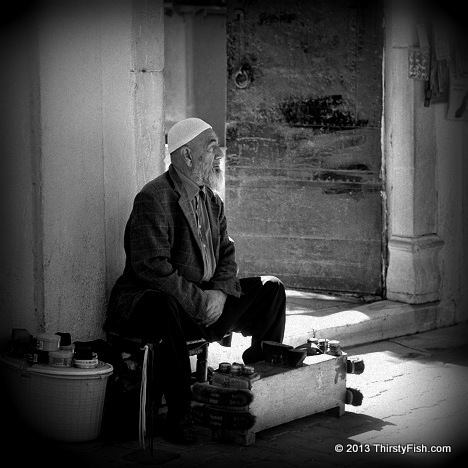 I felt that same sense of modesty without pudency from this shoe-shiner sitting in front of a marketplace mosque in Izmir. Almost as if, the things that matter to him are totally different than the things that matter to most of us. Most of us are caught up in a perpetual rat-race, making us forget the things that matter. We want more money, more status, more education, more, more, more. This "wanting" never stops. We are never fully satisfied. We rarely stop - breathe - and re-prioritize the things that matter. Schools do not teach this. Math and science tell us very little about how we might live our lives. More often than not, our parents, our friends, and our religious beliefs also mislead us. Hence, tranquility eludes most. So, what are the things that matter? Hint: The things that matter are rarely "things". They are related more to our states of mind; The way we view the world around us.